Rules of Court affixed to a post... Did our us of the word"etiquette" actually originate from the Old French, "esquiter"? The term etiquette may derive from the old French 'esquiter' (to affix), a reference to the daily rules of a royal court, which were affixed to the wall for all to read. 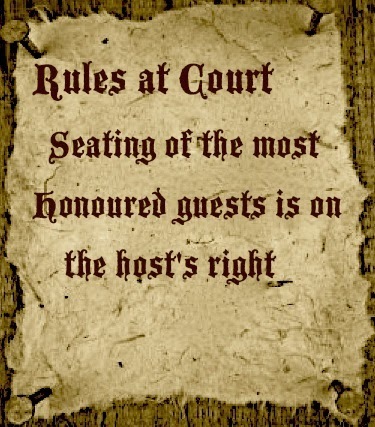 Such rules explained the seating of honored guests on the host's right in southern Europe and on the left in Scandinavia. 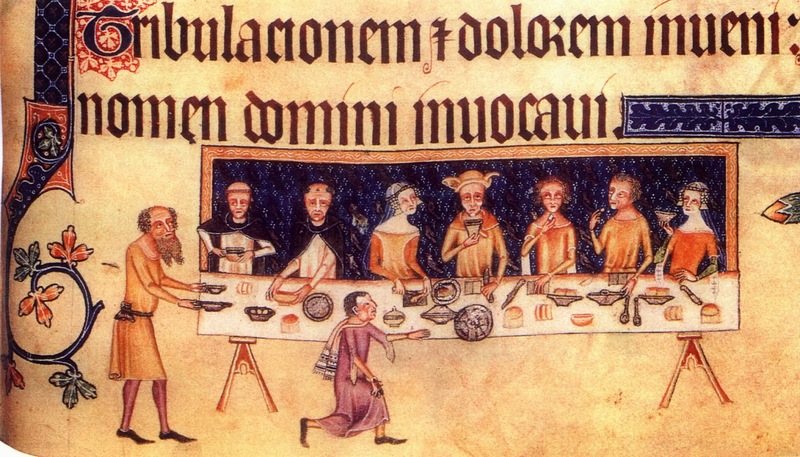 The earliest medieval etiquette document, Count Anthimus's Letter to the Frankish King Theodoric, written around 530 CE, instructed the King about the dangers of gluttony and intemperance. The underlying principle to avoid extremes derives from the familiar Roman dictum nihil nimis (nothing in excess). Anthemis insisted on self control and invade against over indulgence at the table. One polite custom he initiated, the use of no more than three fingers to pick up meat, put an end to unsightly grabbing. Alfonsi's fame rests mainly on "thirty-three tales" composed in Latin, at the beginning of the 12th century. This work is a collection of oriental tales of "moralizing character" or manners. 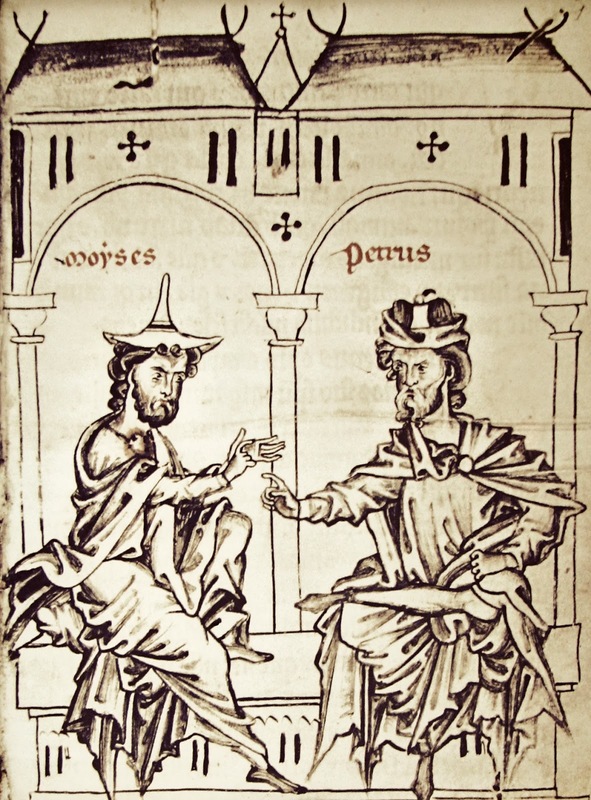 The storyteller and moralist Petrus Alphonsi's Disciplina Clericalis, or Training for a Gentleman, (ca 1100 CE) written in the form of a dialogue between father and son, explained the rudiments of offering guests water for washing hands. Rules for diners explained a necessity of eating only from one's own bowl, taking small bites, wiping the mouth before drinking, and emptying the mouth before speaking. Similar guidebooks reminded the polite guest never to dredge food in the salt cellar. Correct salting required lifting grains of salt by means of a clean knife blade or extracting a pinch a time with clean fingers. An Italian guide, The Treatise on Courtesy, (ca 1200 CE), of Tomasino di Circlaria (or Thomasin von Zerklaere), rooted its advice in musings on gentility and correct behavior a table. The sensible precepts set forth in and other early European books on manners has changed little up to the present time. In Syria, the theologian Gregor Bar Hebraeus (also Gregor Bar'Ebraya or Gregor of Abulpharagus) summarized in table wisdom and effects in Ethicon, (ca 1265 CE). Mindful of the spiritual value of food, he urged diners to be clean, eat quietly and sparsely, and welcome outsiders to the family table. He recommended that meals be preceded by a religious blessing and instructed diners to maintain an upright posture while eating. He also urged that, out of respect for God's bounty, no crumb should be left uneaten. In the late Middle Ages, European behavior manuals introduced a new generation of advice to gentility and deportment. These guidebooks derived from the code of courtly manners intended to suit royalty and to quell altercations arising from the dispute over proximity to the king at table. Representative of these many volumes, which paralleled each other in tone and scope, were the German Der Winsbeke (ca 1200's), The Advice of a Knight to His Son: the Spanish Castigas y Doctrinas que in Savior Dava a Sus Hijas (Admonitions and Doctrines from a Wise Parent to His Daughters, 1406) in which a father advised his offspring on restraint in drinking and eating, and fairness in dealing with table servants; and the essayist Christine de Pisan's Enseignements`a Son Filz Jean de Castel (Instruction to Her Son Jean de Castel, ca 1430), and Livre des Trois Virtus (Book of the Three Virtues, 1405). The English issued similar texts - Boke of Curtasye, 1440, The Book of Curtesey of Lytel John 1477, and Wynkyn de Worde's Boke of Kervinge (Book on Carving, 1513) which assisted kitchen workers and table servants with the proper placement of meats and vegetables on platters, slicing of tarts and pies, and ladling of sauces. Unlike medieval etiquette specialists, Baldassare Castiglione, author of Il Libro del Cortegiano (The Book of the Coutier, 1528), emphasized grace and elegance over pragmatism. One mark of elegance was the male diner's spreading of his napkin over one shoulder as opposed to the female custom of covering the lap. 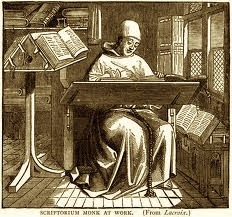 The friar and rhetorician Bonvesin della Riva (or Bonvicino da Riva), author of De Quinquaginta Curialitatibus ad Mensam, (Concerning Fifty Gentilities for the Table, ca 1290), encouraged guests to speak graciously to others at table before sitting down to eat. He advocated courtly manners, proper attire, affability, good posture and self-control. Among the most intolerable behaviors, he included overfilling the mouth, drunkenness, slurping, sneezing and coughing in the direction of other diners, and criticizing the food. He considered picking over dishes a disgrace and abhorred the practice of sopping bread in wine. As a gesture of chivalry, he suggested that a man should cut up meat for any woman with whom he shared a platter. To ensure polite conversation, he forbade swearing and the raising of unpleasant, vulgar, or controversy all topics. Francesc Eiximenis, one of the most relevant writers of the 14th century. Some of the guidelines for good manners sprang from sound principles of health and safety. For example, Petrus Alphonsi's admonition about chewing thoroughly before swallowing is sensible advice to prevent choking. For the conclusion of the meal, he admonished: "After eating, ask for hand-water, for this is required by medical teaching and it is the decent and easy thing to do." A fourteenth-century treatise on dining by Arnaud de Villaneuve, a physician and chemist from Montpellier, France, explained the role of sobriety and moderation in alleviating dullness and lassitude. Arnaud de Villaneuve, explained the role of sobriety and moderation in alleviating dullness and lassitude. One author of a courtesy book, Francesc Eiximenis, a Franciscan friar from Catalonia, inveighed strongly against gobbling food and drinking too much. Chapters 29 thru 37 of his text covers rules of conduct similar to those of Bonvesin. Concerning women, Eiximenes thought it best to sit beside rather than opposite a lady. He warned about spraying other diners with food, picking the teeth, and over doing compliments to the host. He suggested that guests go to the toilet to rid the body of gas before sitting down at table. 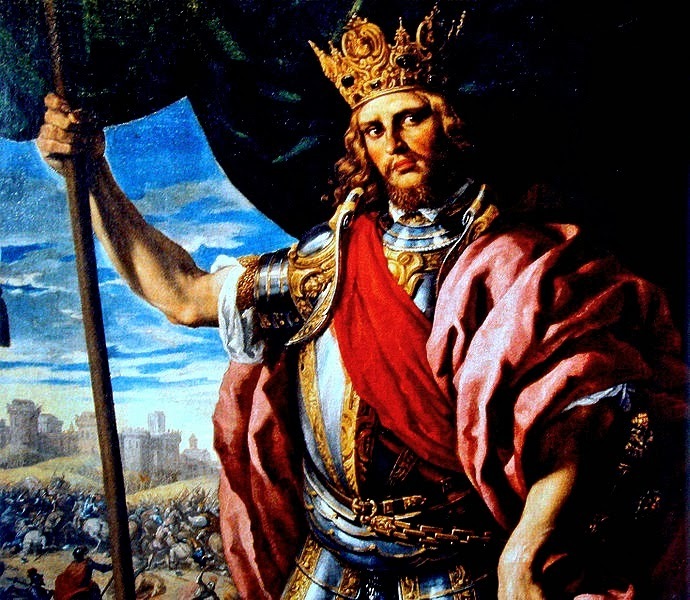 Serving with style and avoiding rude behavior during meals was, to Eiximenis, a form of patriotism -- A way of elevating Catalonia among other European states. In Germany, Tischzuchten (table etiquette guides), including author Sebastian Brant's satiric "Das Narrenschiff" (Ship of Fools, 1454) established the importance of propriety at table, including hand washing before meals. Renaissance guides moved from simple admonitions against unseemly behavior in serving and dining towards matters of deference to lords and ladies. 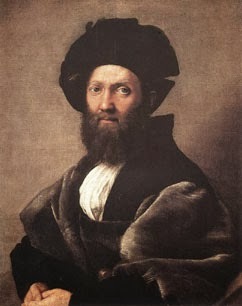 Unlike medieval etiquette specialists, Baldassare Castiglione, author of Il Libro del Cortegiano (The Book of the Coutier, 1528), emphasized grace and elegance over pragmatism. One mark of elegance was the male diner's spreading of his napkin over one shoulder as opposed to the female custom of covering the lap. Less pretentious and status conscious was the Dutch humanist scholar Erasmus, who published De Civiltate Morum Puerilium (On Civility in Boys in 1530), which took up such matters as the wiping of greasy fingers and blowing the nose at table.